That isnt really the campaign map though, as in the map you actually play on, is it? Its more of a demo-picture of where it takes place. Yeah what is it really? What I gather the highlighted area is the demoed campaign map - and is large enough* that there need to be no other campaign maps, this is like what 150x300km already? I can confirm it isn'tn the campaign map. 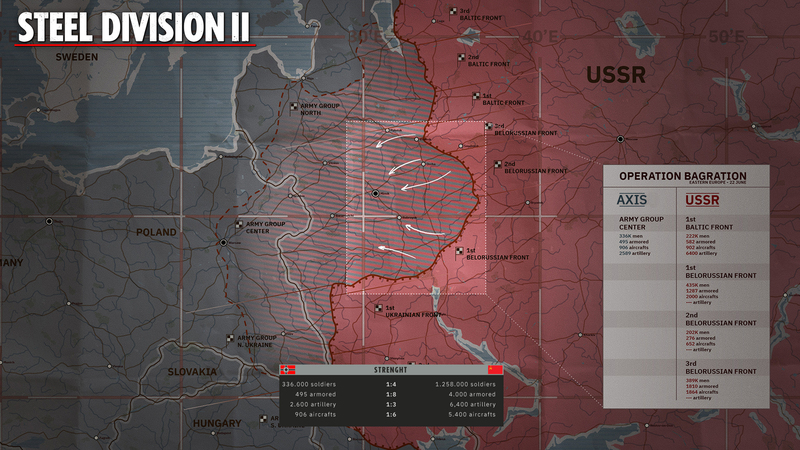 It was a contextual map to explain Bagration to journalists at the Gamescom. Well that sux. Everybody was getting excited about it as that campaign map is great. [EUG]MadMat wrote: I can confirm it isn'tn the campaign map. Why not including it in the game? You could use it instead of a classical menu to choose the campaign you want to play. At release there is of course only "Bagration". But with DLC you could add further campaigns like baltic front, italy or post-Normandy operations in the west. You could just add further squares on the overview map for each operation. And I can choose to play it by clicking on it. A loading screen plus a swag item in the swag shop - 80" paper print with Madmat's autograph to hang on your wall? Oh, and operational drawing on the map too, prepared by... Well, and think if your loading screen before each mission showed the arrows for that part of the operation. Would be a nice touch.